SET UP: Back to back goals. 2 areas (aprox 15-10yds) size depending on age group & size. Diagram shows a squad of 14, 6 v 6 + 2 goalkeepers. Attacking team has 3 players inside area, with 3 players on either side of the pitch. defending team send their 3 players in to win the ball. Attacking team must keep the ball, using outside players to create a scoring opportunity. Scoring goals being the aim of the game. There is a change in possesion if defending team (yellow) win ball. 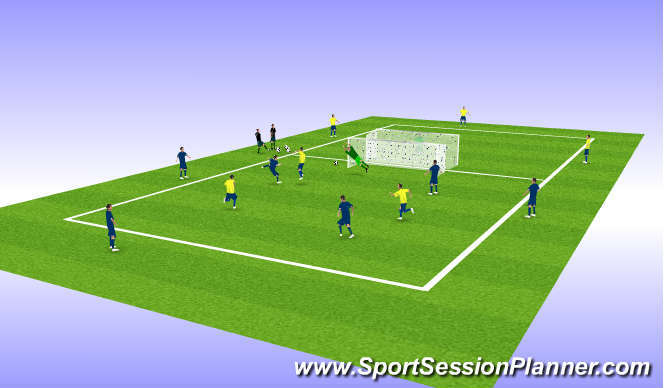 Attacking team shoot off target or goal keeper saves the ball. When a change in possesion occurs a ball is transfered over to other side where the Yellows now have a 6v3 advantage over the blue team. Allow an oppourtunity for outside players to either join in or rotate with middle players. This can be done in a number of different ways.